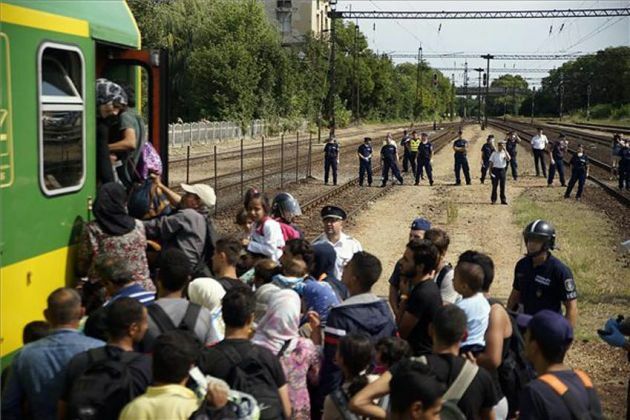 (Photo: LWF / MTI)Hungarian police form a cordon as refugees board a train for northern Europe in Sept. 2015. Thousands of Hungarians have participated in the 'March of the Living' to commemorate Holocaust victims in the biggest 2016 anti-racist march at which Christian clerics expressed repentance for what happened to Jews. The march took place shortly after the remains of about 20 executed people, most of them Jews, were buried in Budapest's Jewish cemetery. "It is a historic moment, when the leaders of the Christian and the Jewish religion are on the same stage together," Gabor Gordon, the head of the March of the Living Hungary Foundation, said in his introduction, the World Jewish Congress reported. The yearly March of the Living is in its 14th year and commemorates the deportation of Hungarian Jewry to the Auschwitz concentration camp, the Jewish Telegraphic Agency reported. It is the largest civic demonstration against racism, anti-Semitism and neo-Nazi and anti-democratic movements in Hungary. Jews have long played a key part in the history of Hungary and at the beginning of the 20th century they accounted for about 5 percent of the population. Today they are thought to number less than 50,000 of the 9.9 million people in the eastern European nation. The ghettoization of the Hungarian Jews started on April 17, 1944 under Nazi occupation. Of approximately 825,000 Jews living in Hungary in 1941, about 63,000 died or were killed prior to the German occupation of March 1944, according to the Holocaust Encyclopedia. Around 437,000 Jews from the countryside were sent to Auschwitz in Poland and the majority of them were gassed in the neighboring death camp of Birkenau, with only a few thousand surviving. At total of 600,000 Hungarian Jews were exterminated in different concentration camps during the Holocaust which occurred during the period around the Second World War. The Hungarian branch of the international organization of the March of the Living Foundation, ahead of the March of the Living to Auschwitz, also holds an annual anti-xenophobic and anti-racist rally in Hungary. This year's march started April 17 from the downtown Dohány Street Synagogue and ended at the downtown Basilica, the largest Catholic Church in Budapest. For the first time, three Christian bishops took part together in the March of the Living and gave speeches on the same stage. "It is a historic moment, when the leaders of the Christian and the Jewish religion are on the same stage together," Gabor Gordon, the head of the March of the Living Hungary Foundation, said in his introduction. The rally started with a moment of silence in memory of Imre Kertész, the Hungarian Jewish writer who died earlier this month at the age of 87, and whose Holocaust novels won the Nobel Prize for Literature in 2002. Hungarian Chief Rabbi Robert Frolich got loud applause in his speech and was speech was openly critical of the Christian churches. "What if the doors of the Basilica had been left open then, during the Holocaust? ... But the doors were not open, the Basilica was closed when it needed to be open," he said. Roman Catholic bishop Janos Szekely said: "We are here now at the March of the Living in Budapest to express our pain and repentance over the killing of more than half a million Hungarian Jewish compatriots." Among those at the rally was the Israeli Ambassador to Hungary, Ilan Mor, who said: "This is now the March of the Living and not as it was 72 years ago, when it was the March of the Dead. Now this is the March of Hope." Géza Röhrig, the star of the Oscar Award-winning Hungarian film "Son of Saul" also appeared at the event.